More Bazinga ahead: CBS has renewed The Big Bang Theory for two more seasons at 24 episodes each, through the end of the 2018-19 season. This brings the episode count to 279 over twelve seasons. Big Bang now joins an exclusive club: the sitcom ties My Three Sons and Two And A Half Men as the second longest-running live-action sitcom in television history at twelve seasons, only behind the fourteen Ozzie And Harriet produced. In fact, Big Bang now ties Men as the long-running sitcom in CBS history, surpassing both M*A*S*H and The Jeffersons (tied at eleven each) in 2014. Though Sons ran twelve seasons, the sitcom’s first five aired on ABC. Of course, Fox’s animated The Simpsons remains the all-time champ at 27 and counting. The show has also been renewed through 2019. Big Bang cast members include Johnny Galecki, Jim Parsons, Kaley Cuoco, Simon Helberg, Kunal Nayyar, Mayim Bialik and Melissa Rauch. According to Variety, both Bialik and Rauch were seeking salary parity with their fellow co-stars, but in negotiations, the five original cast members of the show agreed to shed their salaries at $100,000 each to give Bialik and Rauch raises. However, their salaries still won’t match those of the original cast. Both women joined the show later in the show’s run: Bialik is a veteran of Blossom and appeared in the movie Beaches; Rauch is also a screenwriter, penning the movie The Bronze with her husband Winston. With the renewal comes an extension in the series’ first-cycle syndication contract, extending it through at least 2021. Warner Bros. sold Big Bang into syndication in 2009 to Chicago’s Fox duopoly and TBS for a huge amount of money. 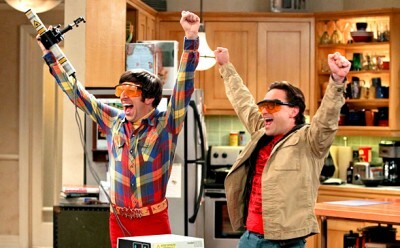 Since debuting in syndication six years ago, Big Bang has ranked as the top off-network sitcom. Recently, CBS and Warner Bros. green-lighted a new series as a prequel to Big Bang called Young Sheldon, which explores the backstory of young Sheldon Cooper growing up in Galveston, Texas (Jim Parsons, who plays Cooper on the show and is an executive producer on the project, is from nearby Houston.) The series is expected to land the coveted Big Bang time slot on Thursdays this fall. As for Big Bang’s plot lines, there has been major changes: Howard and Bernadette had their baby (we have yet to see) while Stuart (Kevin Sussman) moves back in to their house while Raj moves in with Leonard and Penny as he is cut-off from his father (I didn’t know a man in his position earned close to minimum wage – really?). And of course, they are across the hall from Sheldon and Amy. With these changes amid an ensemble cast, The Big Bang Theory is starting to resemble Full House (or Fuller House) than Cheers and M*A*S*H. And no, that’s not a compliment. But at least we can grateful Wil Wheaton won’t be joining the cast full-time.